We all have probably said at one time, “I wish Christmas could be every day.” My kids that can speak have each already said this aloud. Who wouldn’t want presents and family and fun every day for the foreseeable future? My grandma Norma, my dad’s mom, has made a mark on this season for us. She passed away Dec. 14th around 5:30 in the evening. It wasn’t sudden or a surprise but it was still very much felt. She joins my grandpa who passed away a while back. Grandma was a warm, funny, and generous person that was quick with a smile. She would often, when meeting someone for the first time, say, “Glad to know ya,” after shaking their hand. I always thought this was a strange. How could you know someone you’ve just met? But I later realized she didn’t need a whole life’s story over dozens of social lunches to get to know someone. She was content with knowing someone’s name and then accepting them into her life. That’s the kind of person she was. 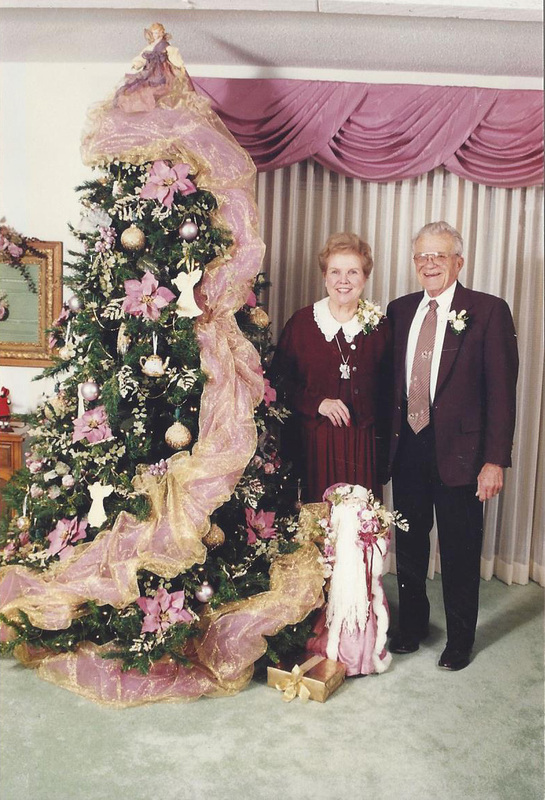 Grandma Norma had the most beautiful Christmas tree in the northern hemisphere. She loved crafting. To say she was good at it would be an understatement. She was always making things and her attention to detail was unmatched. Her handmade birthday cards were awe-inspiring. We would spend hours trying to calculate the amount of hours she put into them. Her Christmas tree was no exception. Golds and pinks dominated the color palette. With ribbon, angels, flowers, and glittering, spinning ornaments clinging to each branch. The best thing about the tree was the snow fall. A continuous fountain of tiny styrofoam balls would lightly rain from above and filter through the branches and decorations to the bottom only to be pumped back up to the top for a return journey. It was fun to watch. Every year she would have a company take it away and store it. When that company went out of business, the Christmas tree found itself on living room watch all year long. Every time we visited it stood tall, proclaiming Christmas in July. Or March. Or September. It was something she and my grandpa embraced. And rightly so. The holidays are a time for caring, generosity, and wonder. All qualities that Grandma carried in spades. Even before the ever-present tree in her living room, it felt like Christmas at her house. It seems fitting that she would take her last breath during this time of the year. She loved it. She lived it. For me, the holiday season will be a reminder of how my wonderful grandma showed us, in word, deed, and decoration, that Christmas truly can be every day. I love you Grandma. I hope you are setting up your Christmas tree and making Heaven a little more beautiful. Ah, I should have known your grandma would be a kindred spirit. This is a fitting tribute, Ryan. Well-done. This is kind of amazing. The year-round tree and the timing of her goodbye? What a treasure. Yes son that touched the heart of your Grandma so well. Thank you for making this tribute for her in history.